Living near the coast means you get to experience the pleasures only ocean can bring. But at the same time, that open body of water can kick up some mighty storms that can you're your part of the world dangerous. Even if you live several miles from shore, your house can still be damaged by strong winds and flood waters during and after a hurricane. That's why it's smart to have a hurricane evacuation plan to keep yourself, your family, and your pets safe. In many cases, when officials declare a mandatory evacuation, you'll have a day or two to prepare. On the other hand, orders to leave can come with little warning, so planning ahead will make things go much more smoothly and comfortably. As a family, have a strategy to reconnect in case you are separated. Choose an out-of-state friend or family member you can call when you are able to give updates. Agree on a couple of potential meeting places. One should be near the neighborhood, such as a school or park. The other should be farther from home, preferably in the next town. Make laminated cards containing this information, along with phone numbers and addresses that can be stored in your wallet. 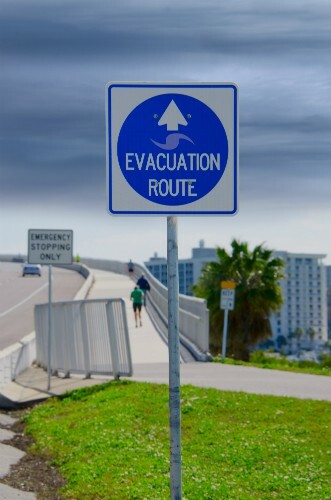 Flooding, downed trees and washed-out bridges can force you to improvise your evacuation route. Be aware of other roads and highways that can take you to safety. If your family has to stay in a public shelter, chances are good that your pet will not be permitted to accompany you. However, many communities don't want pets to be a barrier to keeping people safe. Review your city or county's evacuation plan to learn which local agencies and facilities might be housing pets during an emergency, and stay tuned for instructions during the event. Pack a bag for each family member containing a change of clothes and a copy of your evacuation plan. Every summer, review and discuss the plan with your family. As your family changes and grows, so should your evacuation plan. Make sure all the information is up to date and that the supplies you need are ready to go. With any luck, you won't have to put the plan into action. Being prepared will increase your chances of getting through a disaster, such as a hurricane, safely and comfortably.